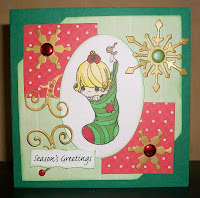 Another card inspired by the aptly named Inspirational Card Sketches blog (ICS #92). This has a diagonal shaped background paper which I have never tried before but works quite well! It also used some more of my golden snowflakes and swirls that I cut out earlier.